LunaHelm Is a Psychedelic LED Bike Helmet That Makes Sure You're Seen in the Dark! LunaHelm Is a Psychedelic LED Bike Helmet That Makes Sure You’re Seen in the Dark! 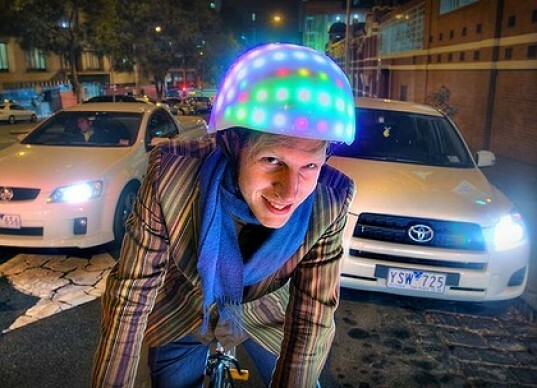 Being visible in the dark is of crucial importance to cyclists and skateboarders setting out at night, so with that in mind the Exertion Games Lab team at RMIT University in Australia has created the LunaHelm — a cycle helmet fitted with 104 LEDs that can be controlled by the wearer to create light signals! Not only does this mean they are seen in the dark, but they can also indicate to traffic where they are turning, without taking their hands off the grips. The helmet itself is a normal cycle helmet, but is covered with multiple LED strips. By carefully positioning the strips, the team was able to cover the curved surface of the helmet evenly in light. The LED system itself is controlled using an Arduino Uno microcontroller, which allows the wearer to use the helmet as a way to deliver turn signals to traffic while riding a bike. While the helmet does look like a glow-in-the-dark mollusc, the team believe the LunaHelm has great potential especially as it can be used to create any visual the user desires, including physical stats. Click below to watch the LunaHelm in action with a musical input! What a ridiculous project. Trying to distract drivers or give cylcists the idea they are better off wearing helmets? Cycling nations don't need that and they certainly don't need people scared off cycling by a idiotic psychadelic helmet. Being visible in the dark is of crucial importance to cyclists and skateboarders setting out at night, so with that in mind the Exertion Games Lab team at RMIT University in Australia has created the LunaHelm -- a cycle helmet fitted with 104 LEDs that can be controlled by the wearer to create light signals! Not only does this mean they are seen in the dark, but they can also indicate to traffic where they are turning, without taking their hands off the grips.